Travellers passing through Leicester Square underground station in 1938 would have been able to see a museum exhibit. 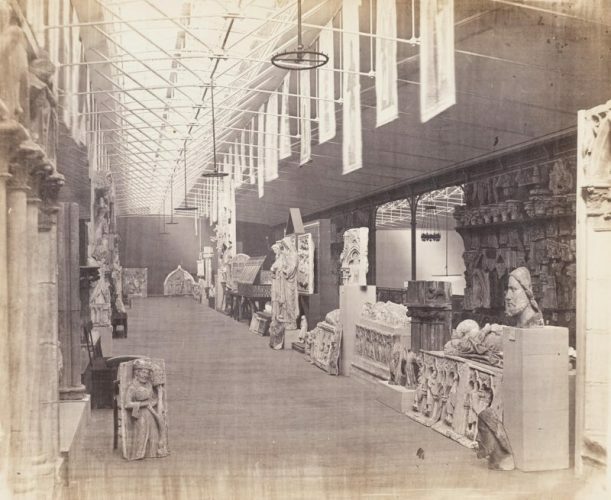 The Victoria and Albert Museum arranged three cases in the rotunda in the centre of the ticket hall, changing the exhibits occasionally. 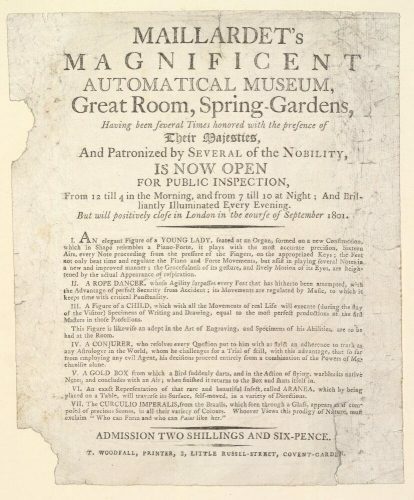 Although the items were not labelled individually, each case had a general caption with adverts for the museum and its evening opening times. Leicester Square was a busy tube station, with 1 million passengers a year, although eighty years later that figure seems relatively low. 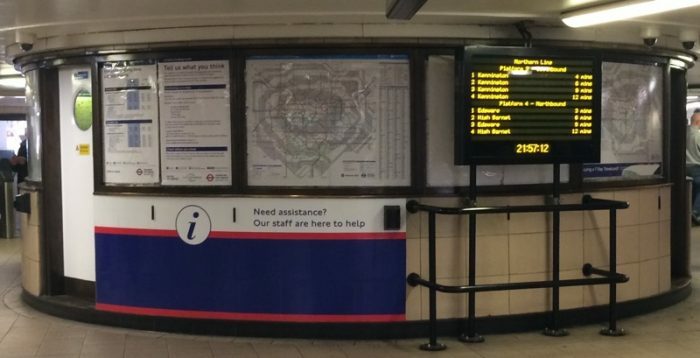 In 2017 the station had 36.7 million passengers. 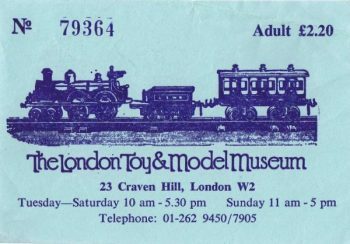 Anyone prompted to visit the museum by the exhibit would have had an easy journey along the Piccadilly line to South Kensington. 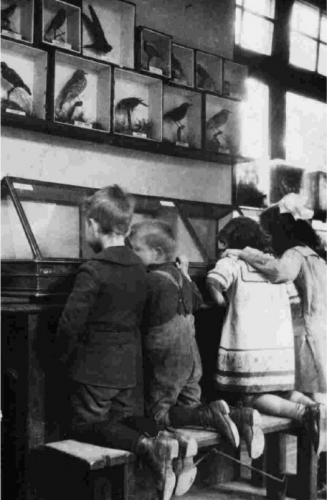 Other museums also had ‘shop windows’ at this time. 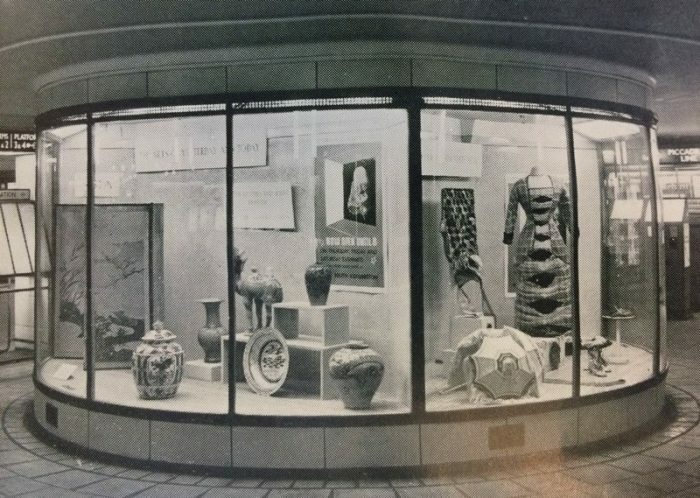 Some had external windows on the street, including the Royal United Services Institution museum in Whitehall, and the Bowes Museum in Barnard Castle had a display in a nearby hotel. 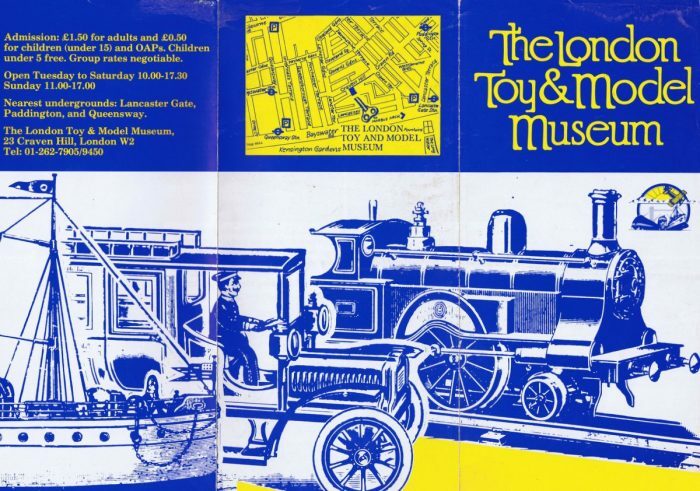 Doncaster museum took a similar approach to the V&A, with a display at the city’s railway station. And the practice continues today. 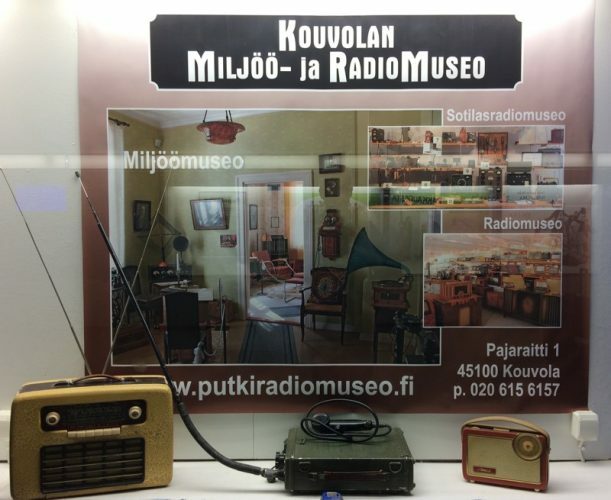 The radio museum in Kouvola, Finland, has a display in the town’s railway station, in the underpass between platforms. 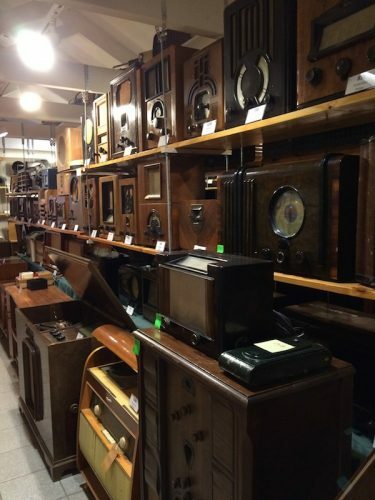 Just a few of its extensive collection of radios feature in a case with an advert for the museum and its neighbour, the Miljöö museum. 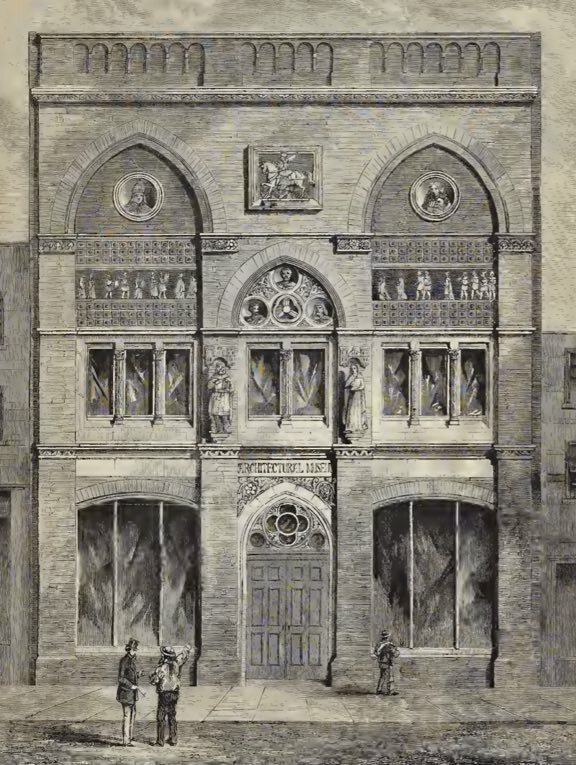 The V&A no longer displays exhibits at Leicester Square – the cases may only have been there for a year. Nowadays the rotunda is an information point. 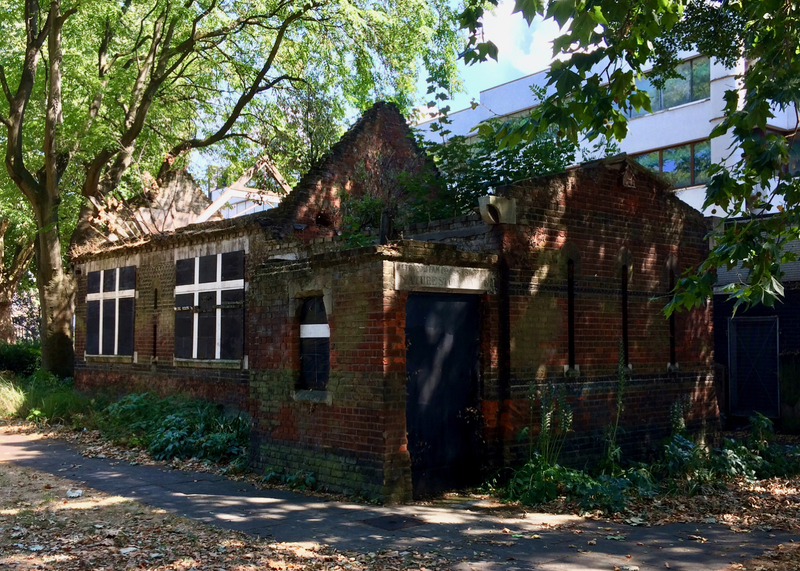 Last year Fiona Candlin proposed a number of candidates for the smallest museum in the UK. Size could be measured by visitor numbers, income, staff numbers, the floor space of the museum, or indeed the size of the collection. By the last criterion, Fiona identified a likely candidate in the Alfred Corry Museum in Southwold, which contains just a single object – a lifeboat. 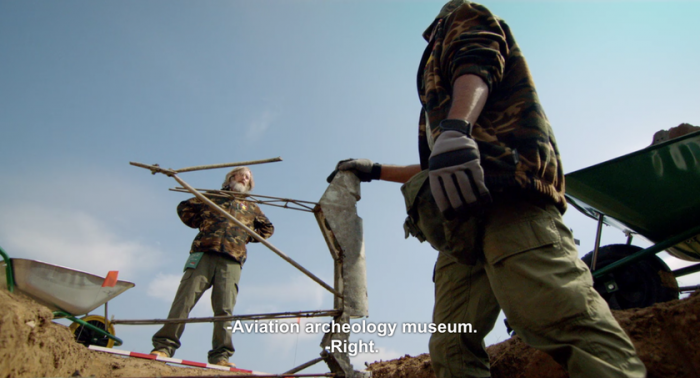 But another museum contains no objects at all. It has no staff, and has a floor area of just 18 square metres. This is the Raisbeck Dame School House in Cumbria. Yet it seems that the smallest museum – classified by floor space – may be elsewhere. 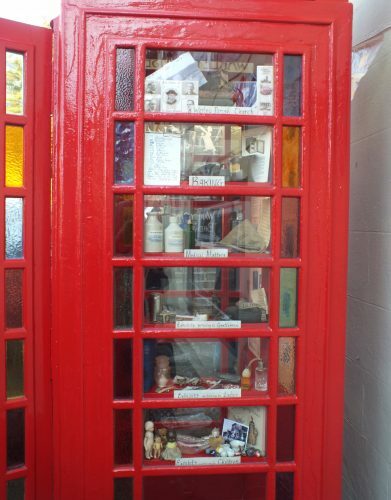 In the village of Warley, West Yorkshire, is a telephone box which has been converted to a museum. Warley Museum opened in 2016, and was recently featured in the BBC programme Monkman & Seagull’s Genius Guide to Britain. Seagull correctly identifies the phone box as a K6 model, designed by Giles Gilbert Scott. The K6 measures 91 cm on each side, making it about 0.8 square metres inside. Monkman and Seagull manage to squeeze into the museum together, although the space would be more comfortable for just one visitor at a time. The tiny museum contains a display of objects, viewable from inside and outside the box, and an information panel highlighting notable people from the village. Surely this is the leading candidate for the smallest museum in the UK. 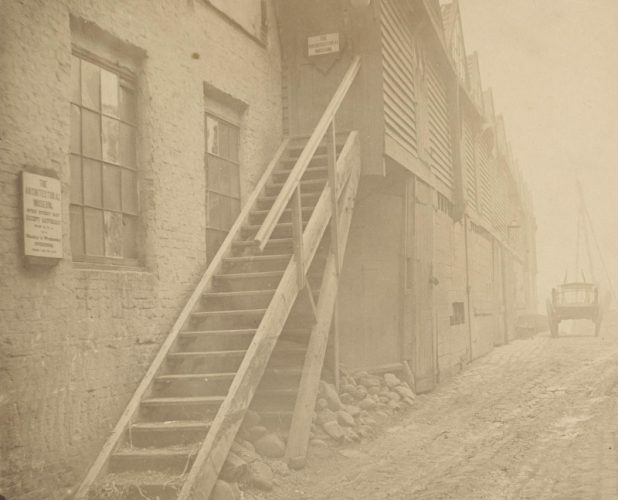 Another online museum that’s come to my attention is Conserve the Sound. It aims to preserve sounds that are vanishing from our lives. So far the sounds are mostly of objects: telephones, walkman cassette players, typewriters, and many more. I particularly enjoyed the sound of the heavy keyboard of Apple’s old tangerine iBook, circa 1999. Laptop keyboards have come a long way since then. 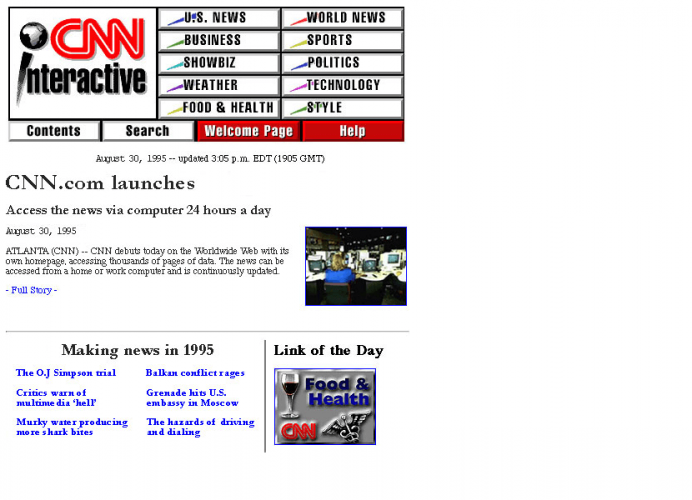 The first website was launched on 6th August 1991 by Tim Berners-Lee at CERN. Websites were text-only to begin with, but it wasn’t long before they started to use graphics. 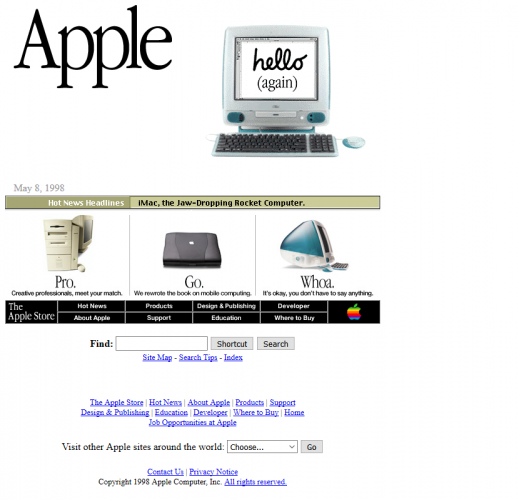 The Web Design Museum collects examples of designs from 1995 onwards. 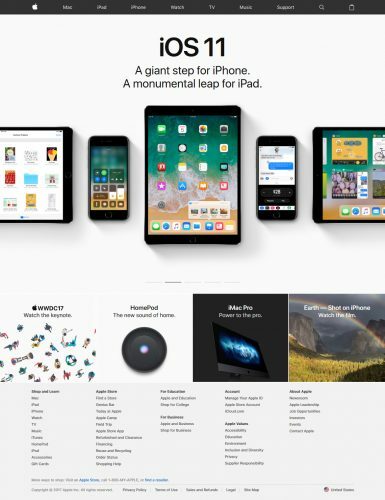 You can browse by year, category, and style, as well as looking at timelines to see how the design of well-known websites such as Apple have changed over the years. 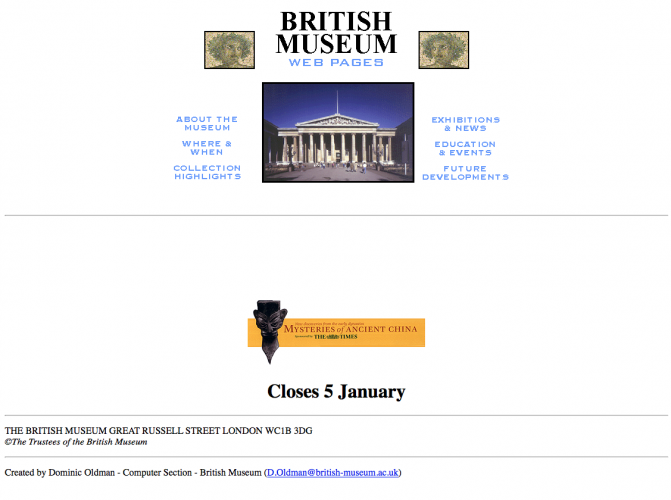 The Web Design Museum doesn’t have any museum websites yet, so I took a look at one example in the Internet Archive: the British Museum. 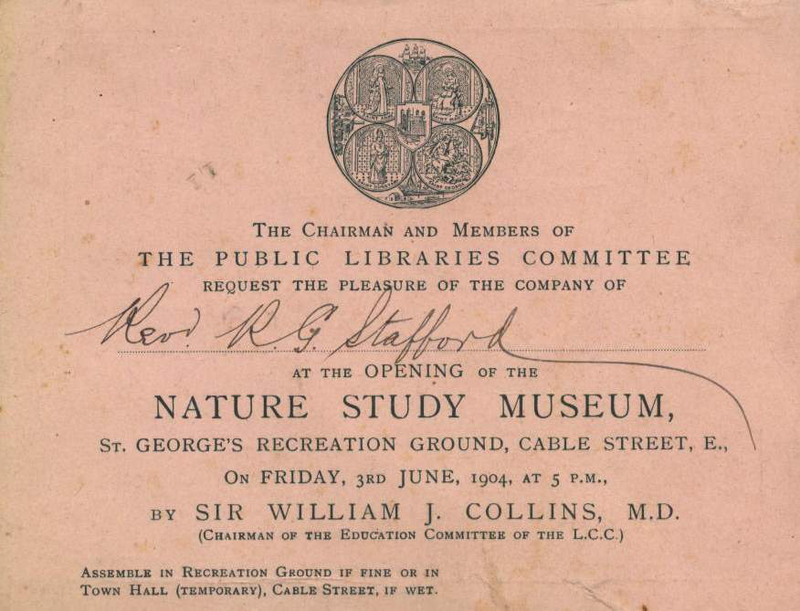 Its site started at an academic domain (british-museum.ac.uk, now defunct) before moving to its current address. See also: Can a website be a museum? 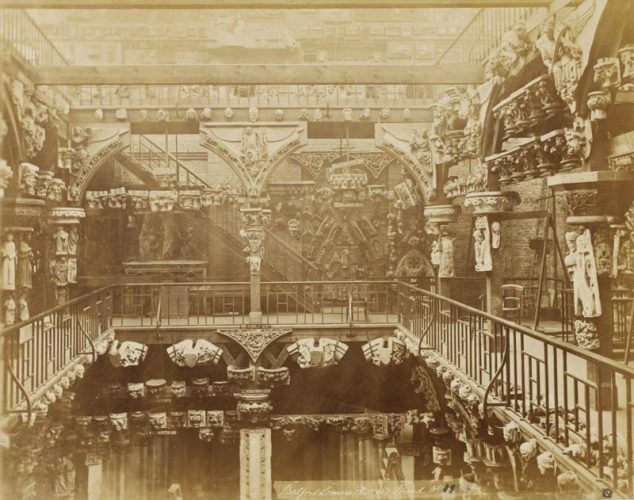 Can a Website be a Museum? Museums are for people to explore and learn from collections for understanding and inspiration. To do this, a museum collects, safeguards, researches, develops, makes accessible and interprets collections and associated information, which it holds in trust for society. 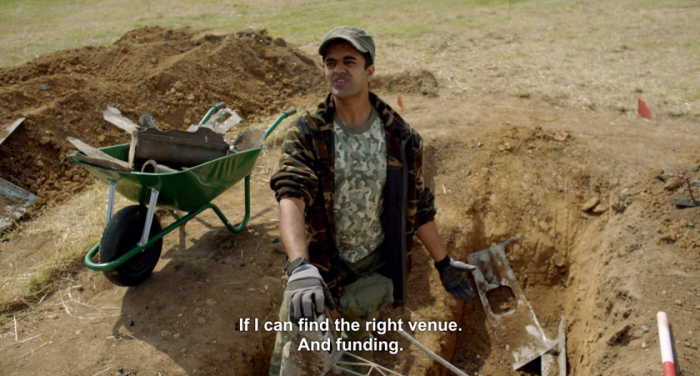 Here the idea of an institution open to the public does suggest a place that people can visit, rather than a mere website, and this would probably be most people’s idea of a museum. Whether websites would be seen as museums under these definitions or not, there are plenty of websites calling themselves museums. The Museum of Online Museums (a meta-Museum?) has been collecting examples for many years. They include websites for museums such as the Rijksmuseum, the Musée d’Orsay and others, art projects such as The Museum of Temporary Art, and a long list of more esoteric collections: The Handheld Games Museum, The Reel To Reel Tape Recorder Museum, the Museum of Obsolete Objects (a defunct Youtube channel), and many more. Many of the sites in MoOM’s list do not call themselves museums, and it might be better to call them archives or collections. 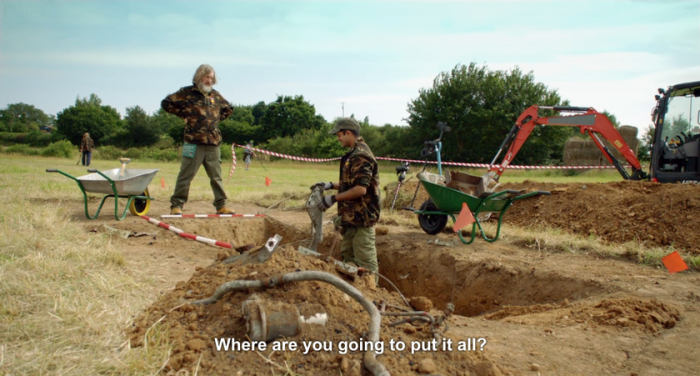 Here’s Part 1 of a film about The Museum of Online Museums. Recently I’ve encountered a few online museums that could be added to this list. The Prefab Museum was originally installed in a prefabricated house in South London. Following an arson attack the Museum has been mainly online, although it also travels around the UK. 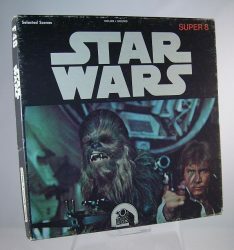 The Museum of Obsolete Media is the online home of an archive of obsolete media formats. Both of these Museums have collections of objects, although the Prefab Museum is no longer open, and the Obsolete Media Museum is not open to the public at all. The World Carrot Museum is of a rather different kind: “The first virtual museum in the world entirely devoted to the history, evolution, science, sociology and art of Carrots”. These three online museums show the range of interests that can occupy those who make museums, whether only online or residing in a more traditional building. We’ll have to wait and see what happens to Hugh’s plans, but the idea that museums are full of old junk is still alive and well.